Yesterday (21 July) was the third annual Harkive day, the global survey of how, where and what people are listening to. The project aims to show how music listening is changing in the digital age through a ‘mass observation’ of people’s listening habits. There’s more about it here if you want to know the background. I’ve taken part in all three years (see my post from 2013 over on my other blog) and am fascinated to read the tweets and posts coming in, and how so many people are still so very in love with music that it’s a sole-focus activity while others feel that love through music being a continuous soundscape behind their day. Check the #harkive tag on Twitter for a taste of what people were sharing. Yesterday was a fairly low-level music day for me. 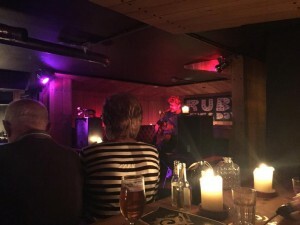 If Harkive had fallen on Tuesday 14 July my diary would have been packed with the sounds of York and the records of Ruby Tuesday – probably a much more exciting post although yesterday is probably a truer snapshot of my listening habits. Looking back over the diary from 2013 my own habits don’t seem to have changed much. I’m still listening to music on my commutes, having fairly silent days in the office (music-wise anyway) and then deeper listening in the evening for pleasure of Louder Than War. I probably stream more these days (for convenience – a poor excuse really) but vinyl is still my preferred format, although CDs are making a comeback for me due to my in-car stereo options. Most week days my musical day starts on my commute. I get somewhere between 35 and 90 minutes to listen to music on my drive (depending on traffic) so can usually squeeze in an album or two. Today I listen to Mammoth Penguins’ Hide and Seek album on CD. I’m woefully overdue on reviewing this wonderful LP for Louder Than War – listening this morning is to try and get my head back into writing mode but it’s a great album – you should definitely check it out! I park up and stream Taylor Swift’s Shake It Off from YouTube on my phone via an FM adapter to the car stereo. This is my current ‘set my day up’ song. Regularly giving it a listen while getting my stuff together to head into the office. Stream Spotify on my phone via a cassette converter (yes, still driving the car with the cassette stereo in). Today I go through this playlist I made, again as an attempt to shift my head space from office to evening work. Smooth radio is the background noise of our home most of the time . It isn’t my station of choice but is ok as a backdrop to our life – although once you’ve heard The Bangles’ Eternal Flame for the third time in as many hours you do have a simultaneous feeling of soporific comfort from the familiarity and the terrifying realisation of the unstoppable passage of time. The kids have some friends over and in-between an epic battle of all the plastic figurines we own (about 300) they are playing Minecraft parody songs from YouTube on their tablet and singing Dumb Ways to Die (with their own added mortal scenarios). Tonight I make a quick drive over to a friend’s house and stream a few tracks from the new Mark Morris album from Soundcloud on my phone via that tape converter in the car. (very excited to have just set up an interview with him!). On the way back I stick a Spotify playlist on shuffle via the same method. At home I head into writing time (still that 9pm to midnight slot that I was using back in 2013). I take a look at a track from the new Widowspeak album on YouTube while on my laptop, then stick side 4 of Taylor Swift’s 1989 on the record deck. As I stop procrastinating and get on with some writing I put The Smoking Trees’ TST album on. And that’s my music listening for Tuesday 21 July 2015. Find out how to submit your story to Harkive on the website. Find me on Twitter as Noble and Wild and as myself. You can read my words about music (when I get round to writing some) on Louder Than War. This week I made the trip up to York to catch up with Chris Helme and hang out at his open mic night, Ruby Tuesdays. Not a bad way to spend a couple of days mid-week in summer but made even better by receiving some good news for my authoring alter ego Riley Reynolds and then finding York to be not only pretty but absolutely bursting with music. I’ve been to York a few times – as a child on day trips to the Minster; on a weekend away with my now-husband; for at least one unconference (pregnant, I spent a lot of time sat down on the bullet train between sessions); and as a parent of a primary school-age child about to study Vikings. But I’ve not really just wandered around and listened to the city, with no other purpose than doing just that. There are a lot of buskers in York. Getting lost between the Shambles and the Minster there were snippets of beautiful street music – a fiddle player, a girl with an acoustic guitar, a man surrounded by percussion against the wall of a church, Amazing Grace on a small keyboard. Mixed with the bustle that is somehow created by many ambling tourists it was the perfect soundscape for peering in shop windows and shading eyes against sunshine to look up at the intricacies carved in old stone. 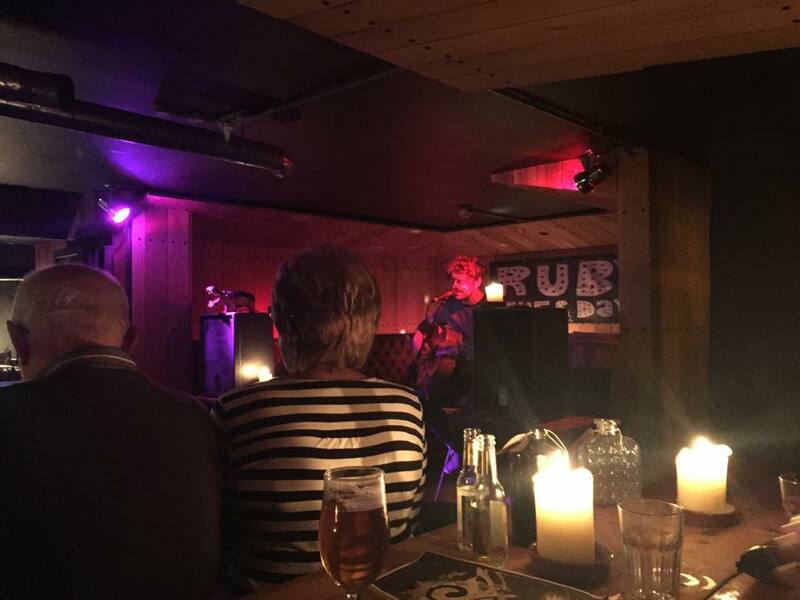 In a basement off a little side street is the candle-light and ruby glow of York’s only Tuesday night open-mic. It becomes packed with people, the soul and funk records cosying around us from the low ceiling and wood-panneled walls. It has a beautiful energy that comes from the pleasure of sharing the playing and making of music. There are a lot of performers tonight – mostly acoustic but all very different, and all of who I would have paid money to hear (especially the quiet ones, late on, who competed with the chatter in the room). There is euphoria in the air, dancing and whooping as the records spin. Magic is conjured here – music, conversation and a love of the way it all comes together in this place. The spell has lasted long beyond leaving York, filling my head with music and sunshine for the rest of the working week. Now I’m already looking forward to a return trip at the end of the summer to listen again to this lovely city and bask in the glow of a Ruby Tuesday. You can find Ruby Tuesdays on Twitter and Facebook. Or, even better, find it in the real world at Sotano on Stonegate every Tuesday from 9pm until really very late. You can find Chris Helme on his website, on Twitter and also on Facebook. Or, even better, you can hear him in real life at one of his gigs (loads coming up) or spinning records at Ruby Tuesdays. 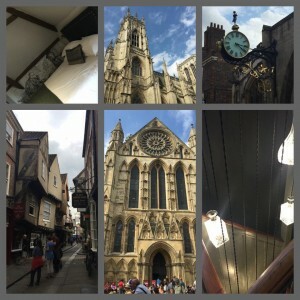 For more on things to do in York then the York Mix looks like a good place to start and were very lovely to speak to as well. I usually post my mid-year and end of year album lists on my personal blog but it feels right to post them on Noble and Wild this time round. It’s a bit more music-y over here right now! So, here is part one (the first half) of an eventual Albums of the Year list. The first six months of 2015 have been pretty great for music, both with big releases and with debuts. Here’s my list of 31 I’ve enjoyed so far (in no particular order) – bring on the rest of the year! The Charlatans – Modern Nature. My review on Louder Than War here. Graw!ix – Good Grief. My review on Louder Than War here. Blur – The Magic Whip. My review of Blur at Hyde Park on Louder Than War here. Charli XCX – Sucker. My review on Louder Than War here. Desperate Journalist – Desperate Journalist. Read what I said about their video for Hesitate on Louder Than War here. Albums I’m already listening to / excited about for the second half of the year are from Mammoth Penguins, Haiku Salut and The Smoking Trees. What did I miss? Leave a comment, Tweet me or tweet Noble and Wild. After promoting a couple of Derby shows in the last few years for him we’re really, really pleased to say Noble and Wild will be working with Chris Helme on his digital PR. We’ll be joining Chris’ team to advise on digital PR, support on his social media profiles, lend a hand with all things marketing and promotion, and some things press enquiry. For those of you that don’t know him Chris is the singer songwriter who first found fame as front man of britpop band The Seahorses, and is now producing acclaimed indie folk as a solo artist. His enviable back catalogue includes ’90’s classics Love is the Law and Blinded by the Sun, from his time in John Squires’ post- Stone Roses band The Seahorses. But more than this it includes his solo albums Ashes and The Rookery, and his acclaimed works with The Yards. Produced by Sam Forrest (Nine Black Alps) The Rookery was critically acclaimed on release in 2012 for its melody and imagination as well as the intricate three-way guitar interplay that brought each track to such lush, blossoming climaxes. With his keen ear for arranging and a voice which is getting better with time, the brooding string passages and delicate folk sounds make for a mix of light and dark which resonates deeply. Chris is due to release a new album in 2015, led by single ‘You’re So Bad’. Get music, find live dates and more at www.chrishelme.co.uk. You can also like Chris on Facebook or follow him on Twitter. For management enquiries contact Kate at Magnificent Artists. For bookings contact Leila at Adastra. You can follow Noble and Wild on Twitter and Facebook.